This birthday card was made for a movie lover! I think the popcorn really looks like it's overflowing out of the box. I thought the ticket with the stamped sentiment all went with the movie theme. I did make alot of the popcorn so I could have plenty of them to put down and then extra so I could put some on pop dots. I did hand write "popcorn" of the tag on the box. Tara this is too cute. Love the bright colors and the popcorn is very realistic. Fun! Great idea to pop up the popcorn! Mmmm...popcorn!!! Love the dimension on this. Fabulous job! Tina: So glad you joined us at Simply Create Too for Challenge #19 - "Anything Goes". 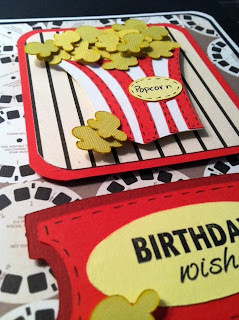 Your popcorn card is wonderful and bet your movie-lover friend will like it too! Awesome job! Love the popcorn :) Ty for joining us for the Simply Create Too Challenge! This is a truly amazing card. I love all the kernals!! I am so glad you found us, played along and followed. Welcome to For Fun and hope to see you again, real soon! I would love it if you stopped by my blog today and peeked about! Yum! 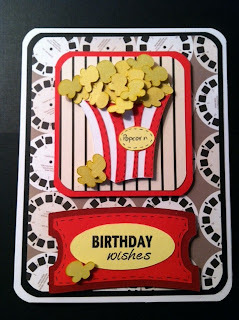 I love popcorn and your card is just poppin'! Thanks so much for joining us at For Fun this week! Oh my, this card is so cute Tara! 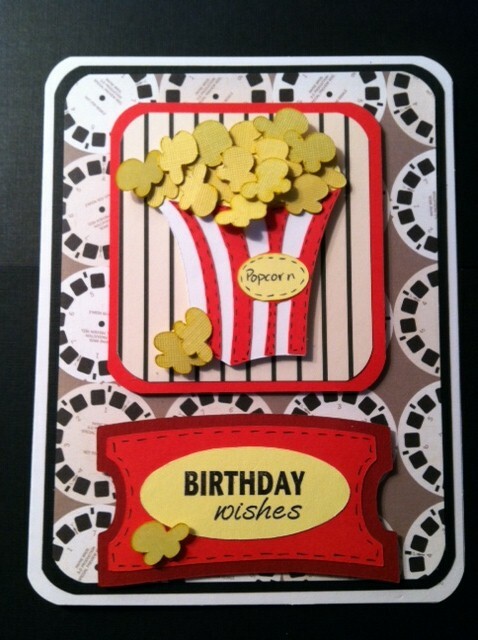 Just love the popcorn overflowing, and with the ticket, it really IS the perfect card for the movie lover. Ohh this is perfect! love the ticket and overflowing popcorn! Thanks for playing with us at For Fun Challenges. Hope to see you Wednesday when a new challenge is posted! Wow, this is wonderful and looks very cute. I love it !! We've Reached Our 200 Follower Goal!! Hoping You'll Soon Be Right As Rain!